The gentlemen of the Tenth Michigan portray the Federal Soldier, circa 1863. In joining a local company, one "enlists" in much the same fashion as did our forefathers. 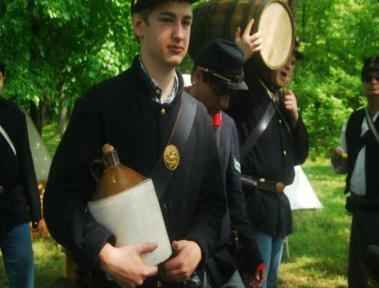 Classroom sessions in addition to the annual Training Camp provide insight for the new recruit into the rudiments of 19th century military drill. 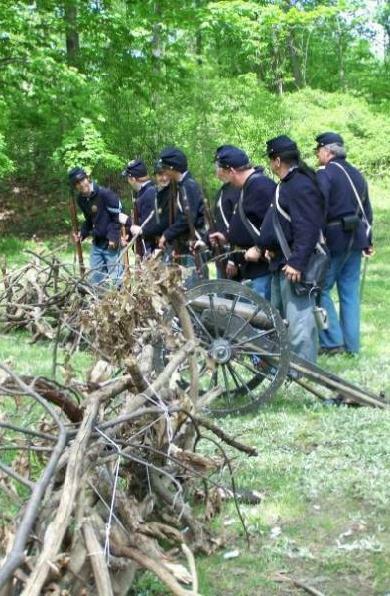 New members will receive recommended equipment lists and sutlers for the proper items for the portrayal of a Tenth Michigan Infantry soldier. The expectation is that all "soldiers" will be fully equipped within 2 years of enlistment and that they will make a commitment for attendance and partcipation at events. Think of us as actors in a play. You will be shot at, but never wounded. You will march into battle, but not required to walk great distances. 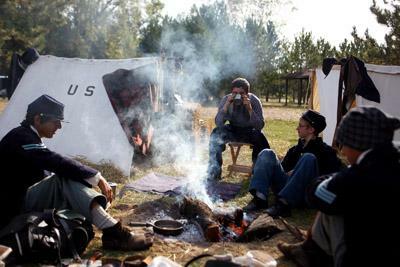 You will camp in the field just as the real soldiers of the1860's. We are authentic minded and do our best to maintain historic integrity throughout the event. 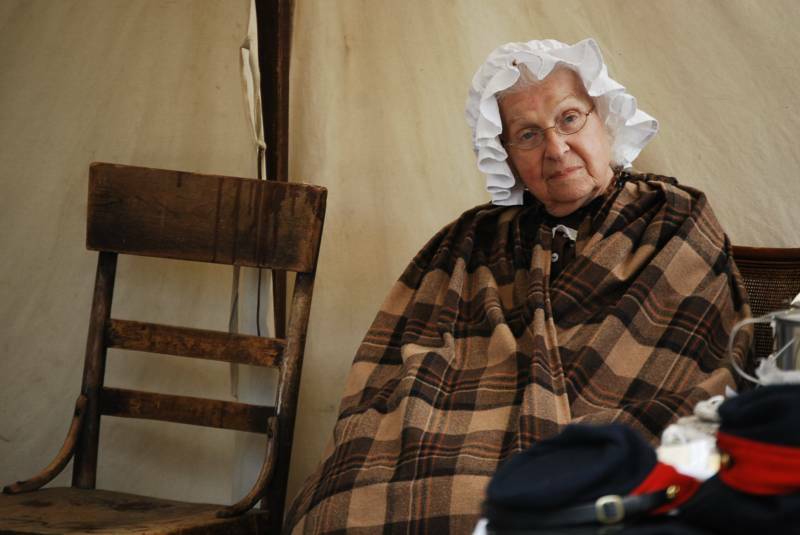 We have living history members ranging in age from Newborn to 90. The ladies enjoy a relaxing weekend, maintaining first person portrayals, sewing , cooking or just chatting with the public. The men have a military camp and they sing, play cards, wrestle, play checkers....oh, and fight the war. Comprised of volunteers, the membership can help you with a uniform for your first event. Arrange for this through email with the General. You will receive a uniform and equipment list upon joining. We do ask that the first items you purchase will be your uniform trousers, shirts, four button sack coat, Kepi (hat) and brogans (shoes). These are crucial for camp life and events. Next, save up for your gun and leathers. We usually have a position in the field for fresh-fish (newbies) such as flag bearer, cook, drummer, telegraph operator, hospital steward etc that only require you to have appropriate clothing and you will not need to be armed. We can find a character portrayal that suits your interests. Just ask for help from Mrs. General Rowley. You look at a beautiful golf course on a bright sunny day, and think to yourself.... What a lovely place for a battle. Hot, black coffee in a tin cup is your favorite beverage. 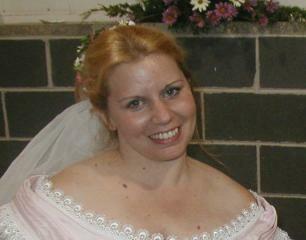 I wonder what she looks like in a hoop skirt? You eat soup and crave a good chunk of hardtack to go with it. You sleep in your uniform in February, just to try it out for spring. We welcome individuals and families. Ms. Elva is 90 years young and still camps outdoors with us. Yes, it is true. There is no time like the present to enlist in the war of Southern Rebellion. If you are an old soul trapped in modern day society, a land of friends who share your love of history await. Because we are so much fun!